Beneath the gnarled pines of the headlands of the Golden Gate, rank upon rank of whitecaps roll in across the Pacific Ocean. With a muffled roar they spend themselves in a surge of foam on the rocks and sands. A foghorn croons in the mist-laden air, warning mariners passing the narrow strait into San Francisco Bay. Along a winding trail on the cliff’s edge hikers and mountain bikers pass over the hilly terrain. For over two hundred years the broad bluffs at the tip of the San Francisco peninsula have protected the approach to the Bay. 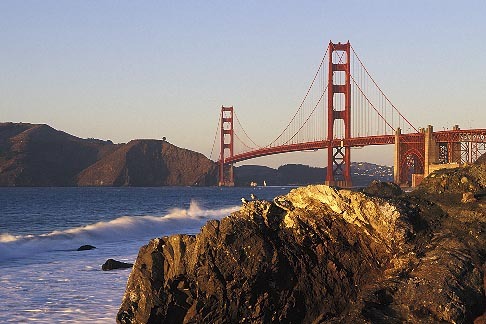 Now they are home to the country’s largest urban national park, the Golden Gate National Recreation Area. For day hikers and photographers alike, the park is a wonderful place to explore nature just a stone’s throw from the city. For a story on the GGNRA I wanted to show the rugged outer shore at the north end of Baker Beach, right at the base of the Golden Gate Bridge. I had scouted this location before, on a foggy morning, and decided the best light would be when the low angle rays of sunset illuminate the bridge with a warm glow from the west. Returning on a clear evening just before sunset (when the tide was low), I scrambled down a rough cliffside path and set up my tripod on the tiny sandy beach. The heavy Manfrotto tripod secured my Nikon and wide-angle lens safely above the waves which lapped the shore. Composing a scene which balanced the graceful arch of the bridge with the rough rocks of the shore, I set my aperture to f/22 for maximum depth of field, to get both the rocks and the bridge in focus. This gave a long exposure – several seconds – to give the incoming waves a light, silky look. At the last moment a solitary seagull settled on the rock so I quickly reframed to include it., and then took a dozen shots, varying the exposures.